Hey, everyone! I know it's been a hot second since I last posted, but work and life kept getting in the way. I just never seemed to get a chance to actually sit down, take photos, and blog. But since I finally have spare time on my hands, I can get back to blogging again and hopefully this time I can maintain a regular posting schedule. 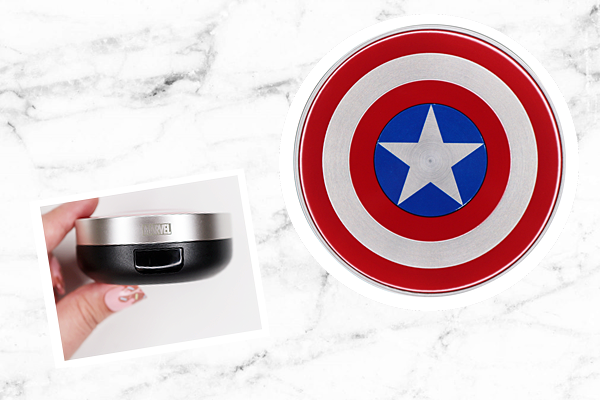 Continuing my love for all things nerdy, I decided to keep going with reviewing more of the products I got from The Face Shop's Marvel collection. 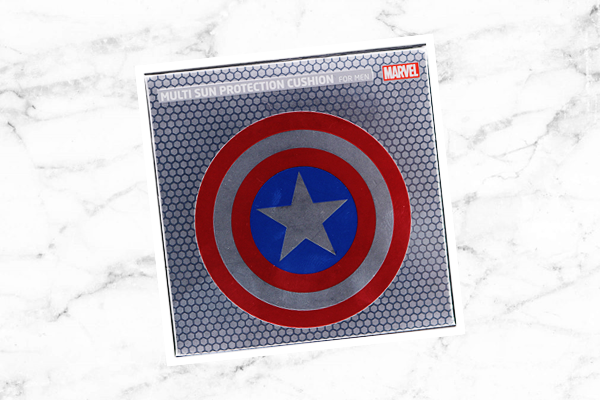 Next up is the The Face Shop Multi Sun Protection Cushion [Marvel Edition]! The Face Shop says... "The Multi Sun Protect Cushion improves the appearance of your natural skin tone without leaving a sticky sensation. Easy-to-use sunscreen helps filter and screen harmful UVA/UVB rays using hands-free application. Improves the appearance of your natural skin tone. Multi functional cushion with BB cream and UVA/UVB - ray filter. Since having extensive skincare and wearing makeup is quite common amongst many Korean men, this cushion is actually targeted for men. I don't think the entire collection is - just this one. Of course, makeup knows no gender so I still happily got this for myself! I'm sure many other women did too. Even if you're not a Marvel or comic book fan, you can already tell the design of this cushion is meant to look like Captain America's shield. The amazing design is what made me want to get this product first from the collection actually! Plus, you can always re-use cushion cases so you can bet I'll be keeping this for as long as possible. Pretty much every part of this cushion is labeled with the Marvel logo, including the sponge applicator. I don't tend to use the ones that come with the cushions when first applying it, but I keep it for on-the-go retouches. As far as I know, this particular cushion only comes in one shade and that's The Face Shop's general N23 shade. I'm an NC20 and I can manage to pull off wearing this even if it's a teensy bit dark for my liking, but I have to make sure to blend it past my jawline a little. It also has a pink undertone to it which I'm not a fan of since I have a strong yellow undertone. Thankfully the contrast isn't that obvious. I could try to offset the pink with a yellow toned powder, but when wearing cushions I don't like to set them with too much powder and I'll explain why in a bit. I'm always happy with makeup that offers a good amount of sun protection too. This has SPF32 PA++ and filters out both UVA and UVB rays. Thumbs up for that! 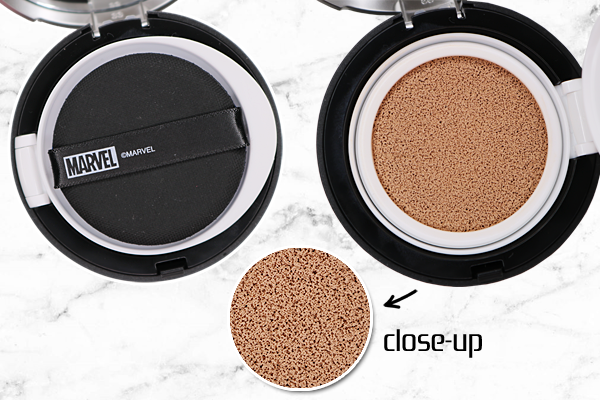 Like many cushions, the coverage of this one is light but buildable. Even without concealer, it can easily cover or diminish the look of minor blemishes and even out your skin tone. 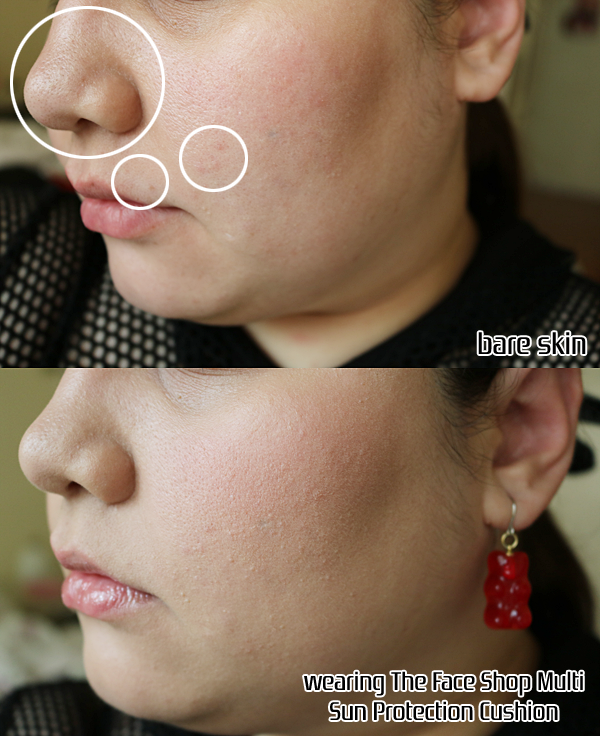 As you can see in the picture, it managed to either hide or minimize the redness/appearance of the blemishes I circled. It also completely concealed all the sebaceous filaments (those 'black dots') on my nose. By the way, I'm already wearing blush in the bottom pic! I just forgot to photograph myself prior to applying it. Felt the need to mention that as this additionally helps cover up any redness on my skin. So yes, that's not 'natural' skin redness on my cheek, just blush. Haha. After applying, it instantly leaves a semi-dewy finish that you can choose to 'matte down' by setting it with powder or leaving it as is. Since I always prefer a dewy finish to my skin, I apply just a very light dusting of powder on my t-zone then seal everything in with a setting spray. The staying power of this cushion is impressive too, especially given its light coverage. Even without powder or a setting spray, it can pull through humidity, sweating, and long hours with only minor fading. Of course, since my skin is in pretty good condition most of the time (*knocks on wood*) it's difficult to tell how much product has disappeared at the end of the day as my skin doesn't look that different without or without makeup. Buuut, when I do use a makeup wipe I can still see plenty of product on the wipe itself so safe to say most of it still remained intact. Okay, so this cushion isn't a stand-out from many of the others I've tried before. It's decent, plain and simple. I already have cushions that not only match my skin tone better, but they have a nicer finish, higher coverage, etc. I know there are better ones amongst the entire Face Shop collection too. But let's face it, one big reason you're getting this is for the limited edition packaging. It's why I did! So if you're a Marvel fan like myself, this is worth getting for the ~aesthetics~ alone. In the end, you can always replace the original cushion inside for one you prefer.